The generic name Sphenophyllum was initially used for Carboniferous-Permian impression-compression specimens of wedge-shaped leaves borne in whorls. Today the generic name not only includes numerous species of leaves, but also impression-compression and structurally preserved stems, roots, and leaves, as well as whole plants (Baxter, 1948; Reed, 1949). 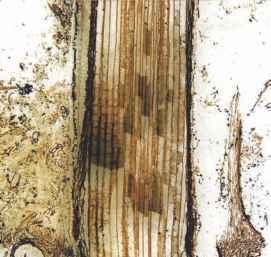 Impression-compression fossils assigned to Sphenophyllum include linear, spatulate, or fan-shaped leaves that extend up to several centimeters in length. The leaves are arranged along the axis in nodal whorls (sometimes termed verticils) of six or nine; the whorls are attached at various angles, but often at 90° to the axis. Whorls may be isophyllous (all leaves of the same size and shape) or anisophyllous (some leaves differ in size and/or shape from the others). Bilaterally symmetrical whorls with two pairs of large and one pair of distinctly smaller leaves are termed trizygoid. Each leaf is vascularized by a single bundle that enters the base and dichotomizes several times before terminating at the margin. Numerous Sphenophyllum species have been studied by means of cuticular analysis. 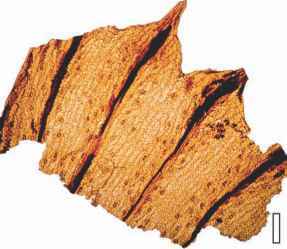 The epidermis consists of thin-walled, irregularly isodiametric-to-elongate epidermal cells that usually possess sinuous anticlinal walls (FIG. 10.7). Stomata are confined to the abaxial surface of the leaf; the stomatal apparatus typically consists of two guard cells with polar and circumporal thickenings and two subsidiary cells (syndetocheilic-type stoma), one of which is distinctly larger than the other (FIG. 10.8) (Pant and Mehra, 1963; Barthel, 1997; Yao et al., 2000). Other species, however, appear to have been haplocheilic, with three to six subsidiary cells surrounding the guard cells (Abbott, 1958; Good, 1973). 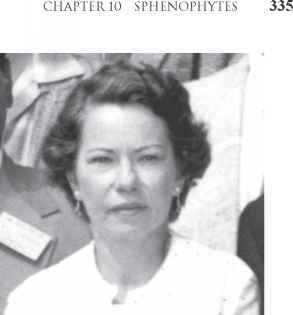 In some species, hairs up to 1 mm long occur along the margins (Abbott, 1958 (FIG. 10.9); Barthel and Müller, 2006). 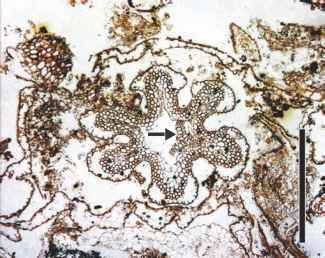 straight veins; and Paratrizygia, with trizygoid leaf arrangement and curved veins (Asama, 1966, 1970; Kim, 1989). Sphenophyllum multirame is a structurally preserved stem with attached leaves from Middle Pennsylvanian coal balls in Illinois (Good, 1973). Two types of leaves were produced: small, linear leaves (1-4 mm long) in whorls of 5-12 and larger leaves borne in whorls of 6. The larger leaves are superimposed from one node to the next, that is, they overlap the node above, and their margin may be blunt or deeply incised, with up to nine veins present at the distal edge. In the highly dissected forms, longitudinal furrows on the abaxial surface correspond to each leaf lobe. Leaves of S. multirame are hypostomatic, with sunken and randomly oriented stomata. A distinct mesophyll is present, but no palisade layer identified to date. Structurally preserved stems of Sphenophyllum are common in coal-ball permineralizations throughout the world. 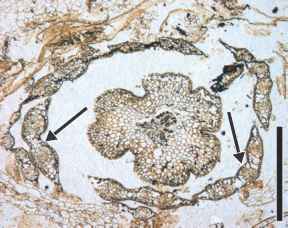 figure 10.11 Distal end of Sphenophyllum plurifoliatum stem showing cortical tissues. Six arms represent bases of overarching leaves. Note triangular stele (arrow). (Pennsylvanian). Bar = 1 mm. figure 10.12 Young Sphenophyllum plurifoliatum stem (Pennsylvanian). Bar = 0.5 mm. stems (FIG. 10.13), the remainder of the axis consists of a parenchymatous cortex bounded by an epidermis in which the cells are filled with opaque materials. Older stems have abundant secondary xylem, with fascicular tracheids (those opposite the protoxylem arms) that are considerably smaller in diameter than interfascicular tracheids (those between the arms) (FIG. 10.14). The secondary xylem tracheids are vertically elongated (FIG. 10.15), with tapering end walls and circular-elliptical bordered pits on the lateral walls. Some tracheids are up to 30 mm long (FIG. 10.15) and are among the longest known tracheids of any vascular plants, living or fossil (Cichan and Taylor, 1982a). Extending through the wood and into the phloem are narrow vascular rays (FIG. 10.14). 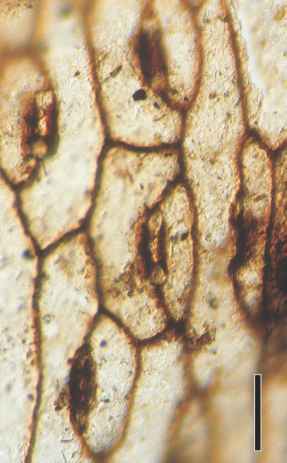 The vascular cambium in S. plurifoliatum is considered determinate, as there is no evidence that the fusiform initials underwent anticlinal divisions (Cichan, 1985b). The increase in stem diameter was accommodated by an increase in the size of the fusiform initials. This pattern of secondary growth in Sphenophyllum parallels that found in several Carboniferous lycopsids but is unlike the developmental sequence in seed plants. There remains some uncertainty as to whether the vascular cambium in Sphenophyllum is unifacial (Cichan and Taylor, 1990; E. Taylor, 1990) or bifacial (Eggert and Gaunt, 1973) and, thus, whether phloem is primary or secondary in origin. Sieve elements have horizontal to oblique end walls and vary in diameter, depending on whether they are fascicular or interfascicular. Although sieve areas have been reported once (Stidd and Ma, 1978), they have not been studied in detail. Secondary cortical tissues are produced by a single persistent phellogen. Periderm cells are arranged in distinct radial files and appear tabular in transverse section. figure 10.13 Young Sphenophyllum plurifoliatum stem with surrounding leaves (arrows). (Pennsylvanian). Bar = 1 mm. figure 10.14 Mature Sphenophyllumplurifoliatum stem showing central triangular body and small diameter fascicular and large diameter interfascicular secondary xylem elements (Pennsylvanian). Bar = 1 mm. 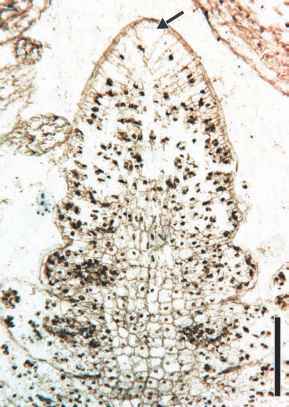 figure 10.15 Longitudinal section of Sphenophyllum plurifoliatum stem showing extended length of tracheids (Pennsylvanian). Bar = 2 mm. The apical meristem of Sphenophyllum consists of a tet-rahedral apical cell that includes a triangular upper surface and three, triangular internal cutting faces (FIG. 10.16) (Good and Taylor, 1972). 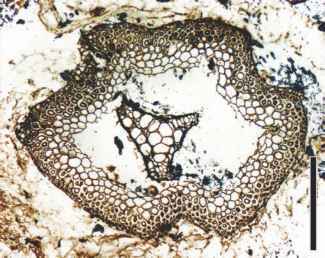 The production of derivative cells (segment and sextant cells) occurs in a dextrorse direction similar to apical cell production in the genus Equisetum. These patterns appear to be consistent for a given species. In addition to apical growth, Sphenophyllum axes increase in length as a result of intercalary meristematic activity. 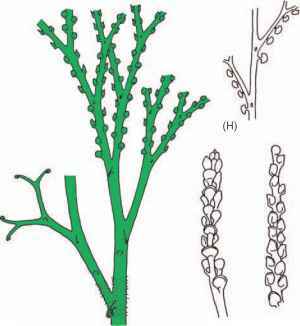 The roots of Sphenophyllum were adventitious and rarely produced laterals (Storch and Barthel, 1980). 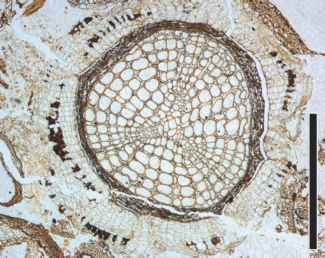 Anatomically, they possess the same complement of tissues as the stems, although the primary xylem in the roots is typically diarch. In some specimens, an extensive periderm was developed (Baxter, 1948). figure 10.16 Longitudinal section of Sphenophyllum apex showing triangular-shaped apical cell (arrow) and derivatives (Pennsylvanian). Bar = 200 pm. How is the slide of stem of sphenophyllum sp? What type of fossil is the sphenophyllum? Which part of sphenophyllum is preserved?